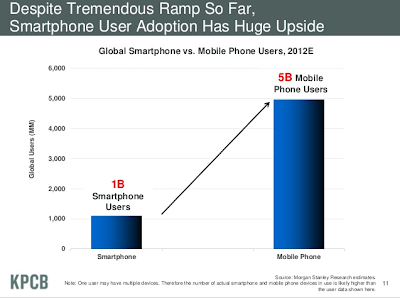 As shown in this slide from Kleiner Perkins' Mary Meeker, there are about 5 billion mobile phones in the world, but only 1 billion of them are smartphones. The entire presentation is available online. This is a perfect opportunity for the stateless model, in which a simpler, lower-cost device handles your connection and user interface, but all data and application activity is in the cloud. Mozilla's Firefox OS is nearing readiness to seize that opportunity space; this ZDNet article provides an update, and useful insight into the way Mozilla sees the stateless model as applied to ownership and rights licenses. Mozilla VP of mobile engineering Andreas Gal is quoted by ZDNet on this idea: "You sign in with your identity and when you purchase an application you really purchase the application for that identity and not the device. For example, if I sign into my identity and purchase the New York Times app and then go to my desktop browser and assign the same identity, I essentially take that content with me," Gal said. "Content is no longer bound to one specific device, it is now bound to my identity that I can take with me to all these different devices." This is precisely the decoupling of device, data, and application I've evangelized for almost two years. The battles of the future are not between legacy operating systems like Mac and Windows, iOS and Android. They are between different stateless delivery models and the ecosystems that support them, now reflected by Chrome OS and Mozilla OS. These are going to be interesting times.